A while back I had an idea for a show that would be split between two geographically separate locations. The premise for this, was to try and explore the notion that our experience is mirrored elsewhere by other unknown persons. I wanted the works to allude to the fleeting realisation that, in certain moments, we share a connection with strangers who are having a similar experience. Thus the show would suggest a twinning of sorts and references the concept of a doppelganger. The idea was that I would create pairs of paintings, which would then be split and exhibited in geographically separate locations. The two shows were to open simultaneously, and the audience was to be made aware of the fact that there was another, almost identical exhibition, happening elsewhere, thereby actualising the feeling of mirrored experience. The geographical splitting of the works would also reference the idea that while two people might be looking at exactly the same image, their perception of that image will differ, and one can never fully know the vision of the other. Initially the show was to consist of 42 pairs of paintings - each representative of a year of my life. However due to the circumstances of our life this troublesome year, I never got to finished all of the works and arrange two galleries to host the exhibition. I did however complete about 30 pairs of paintings. 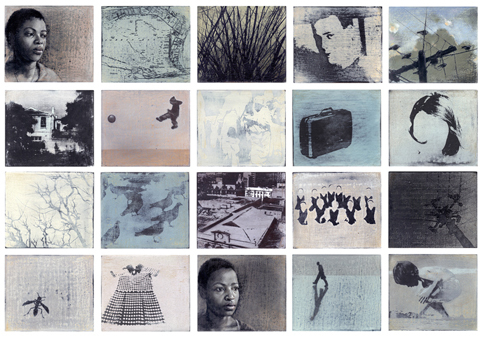 Earlier this year I was approach by Carol Lee to participate in a group show in Johannesburg, which I agreed to. I was also asked to participate in a DUT Fine Art staff exhibition here in Durban. As luck would have it, the two separate, unrelated shows' dates coincided and I thought it would be a good opportunity to realise at least part of my concept. The group show in JHB is entitled FUSION. The preview is this Friday, November 9th (12h00 - 14h30), Upstairs@Bamboo. The exhibition opens at 09h30 on Saturday 10th, and can be viewed until the following Sunday. The Staff show in Durban opens at 18h00 at the DUT Gallery (Steve Biko Campus) on Wednesday, November 14th and will be up for a week. This will be the last time I am exhibiting in South Africa for a while. The paintings are small and affordable so if you ever wanted to own one of my works, now is your chance.